Made of copper, wrought iron and steel, she stands 305 feet tall, including the pedestal. “Liberty Enlightening the World” — better known as the Statue of Liberty — may be the most recognized and powerful symbol of freedom in the world. It is a singular beacon that encompasses the American Dream. Often thought of as a gift from France to the United States to celebrate our centennial, the true story of the sculpture’s journey to New York Harbor is a curious mix of hubris, creative fundraising and the drive to create the biggest statue in history. Frédéric-Auguste Bartholdi, the French sculptor, was influenced by the size and scope of Egyptian structures. He served in the Franco-Prussian War, and his worldview was shaped by the experience of seeing the smoldering ruins of France. He had a penchant for the grandiose. His vision matched a quintessential lighthouse beam of liberty and his own narcissistic desire for fame and greatness. Two other Frenchmen also played pivotal roles. Édouard de Laboulaye was a political figure who first proposed the idea of a monument for the United States. Alexandre Gustave Eiffel (the designer of the Eiffel Tower) designed skeletal framework that allowed Lady Liberty’s copper skin to stand upright. But Bartholdi was the key figure in making the statue a reality. His vision of the statue was originally designed for the Suez Canal in Egypt. He wanted to build a woman holding a lamp and wearing a loose-fitting slave dress to stand as a lighthouse at the entrance of the canal. Egypt let the deal fall through, and the French artist focused his efforts to build a new colossus toward America. Laboulaye almost stole the idea and commissioned his own “Statue of Liberty” — a mere 21-foot monument to be exhibited at the 1876 world’s fair in Philadelphia. Fortunately for Bartholdi and the United States, the project never got off the ground. While only the hand clutching the torch was completed in time for the world’s fair, it exhilarated crowds, who could now envision the sheer size and scope of the project. Bartholdi did not exactly ask permission — either from his own government or the U.S. government — to raise funds for the Statue of Liberty. In fact, he was quite deceptive. He undersold the scope of America’s responsibility to pay half, as well as the financial commitments he was making for debt-ridden France. They had no idea he was fundraising. Bartholdi met with a congressional delegation and indicated that the French people would build this monument to liberty (which was not agreed to), and all the U.S. had to do was provide the location and the pedestal. America declined. New York Governor Grover Cleveland vetoed the dollars to be allocated, and fundraising for the pedestal stalled. By the time publisher Joseph Pulitzer offered to print the name of every donor in the New York World, the statue was completed and assembled in Paris. Some 120,000 donors raised $102,000, with 80 percent of the donations being less than a dollar. For a location, the U.S. selected Bedloe’s Island, an old fort site, which along with nearby Ellis Island is part of the Oyster Islands in New York Harbor. 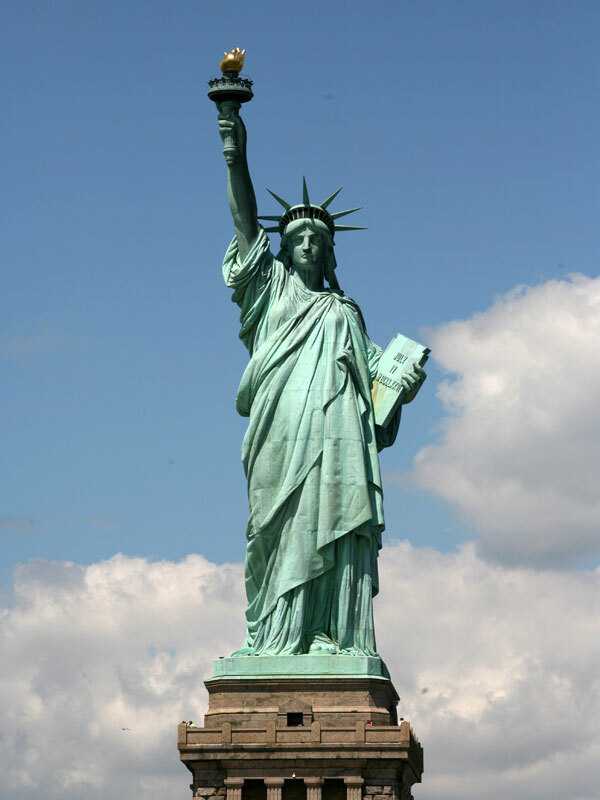 (The statue’s home was renamed Liberty Island by federal act in 1956.) The statue was completed in France in July 1884. It was broken down into 350 individual pieces and shipped by frigate. It arrived in New York Harbor in June 1885. The statue’s granite pedestal was completed in April 1886, and Lady Liberty was reassembled atop the pedestal in four months. Ten years after America’s centennial, the Statue of Liberty was dedicated by President Grover Cleveland. Women’s rights groups criticized the statue due to the fact it represented liberty for a gender that, at the time, had no liberty to vote. Since then, the Statue of Liberty and the island grew as an inspiration to immigrants who sailed past her on the way to a better life. For the statue’s 100th birthday in 1987, President Ronald Reagan appointed Chrysler Chairman Lee Iacocca to lead a restoration effort. The group raised $87 million under a public-private partnership with the National Park Service and the Statue of Liberty–Ellis Island Foundation. It became the most successful public-private partnership in American history. In 1903, the poem “The New Colossus” by Emma Lazarus gave voice to the Statue of Liberty and placed her among the Seven Wonders of the World. It was intended to speak to the millions of immigrants who came to the United States. Every generation has a responsibility to the next to protect and defend our liberties. All of us in the nursery and greenhouse industry share in being blessed to live in a country like America. Happy Fourth of July!